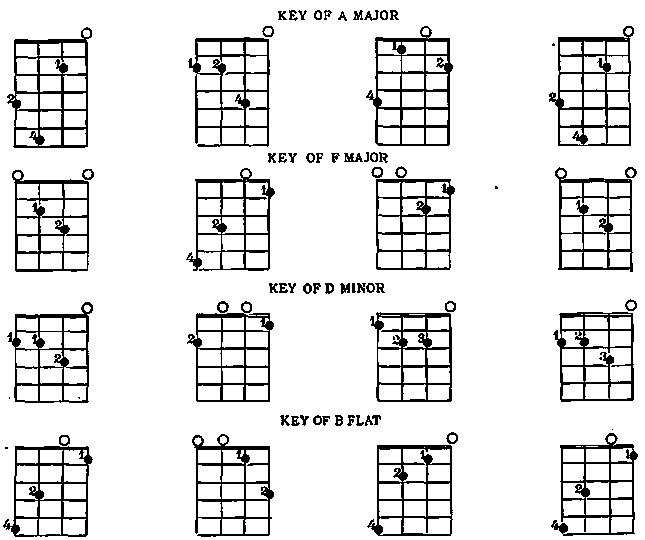 To play chord in any key as per accompany -diagrams. The dots show the first chord, the X the 2<) chord,the ^ the 3d/chord. Chords may be played in all the keys by following this scheme. The Is-* finger in all cases bars two strings and 3<! and 4*1> finger takes the other string. In the next diagram the scheme is different -the first chord (Tonic) being the highest on the fin�gerboard-then go back 8 frets-then the next chord two frets higher, where a player has a good ear and can improvise accompaniments these hints will be of service for with a good ear for har�mony it is a simple matter to" rag "an accom�paniment "by ear."